There’s a lot of reasons to like french fries. They’re cheap, they’re easy to make, they’re simple, and more importantly they’re delicious. A good french fry is a philosophical quandary of the culinary arts in that it can operate as both a side to any meal on the planet, but can also be it’s own meal. Sure, when some people bring up french fries, they think of the inconsistent pieces of yellow cardboard served by the likes of McDonalds and Burger King which can range from limp and greasy to starchy and dried out. Yet there is a whole world of fries out there to be had, and all one must do is dine at a few restaurants to notice. Certain types go for the golden and juicy variety, some are crusty with a bit of a zing, and some are just down-homey and simple. Everyone’s got their own way of making them, and most are delicious. Plain and simple, french fries are bangin’, as they say. See how bangin’ they are? Pour oil into a frying pan to about 1″ deepness and heat it on medium. Cut your potatoes up into your french fry shape of choice. The easiest method is just to stick with long strips. Place the cut up potato pieces onto a bed of paper towels, and cover them. Squeeze the potato between the paper towels to draw out the moisture in the potatoes. Begin adding the potato strips into the hot oil until the pan is full and begin cooking them, periodically stirring to make sure they don’t cook together. Remove the fries once the bubbling around them has subsided, about 3-5 minutes. Place them on paper towels to drain the oil, and salt them to taste. Easy enough, right? Well what if I told you you could make those french fries taste 10x better, and it only took an added 2 minutes of work? If so, then I’d like to direct your attention to our easy fry batter recipe. 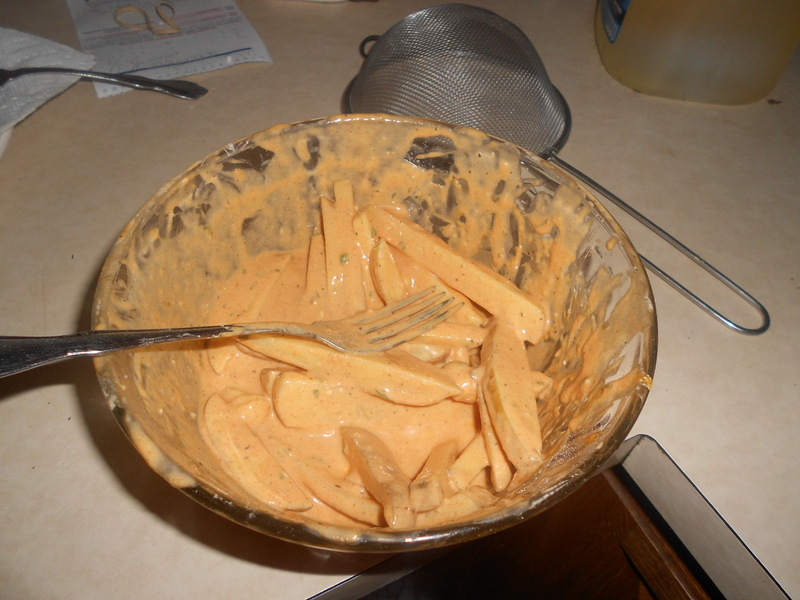 Using this beige goop, you can turn normal fries into savory, delightful, battered fries. 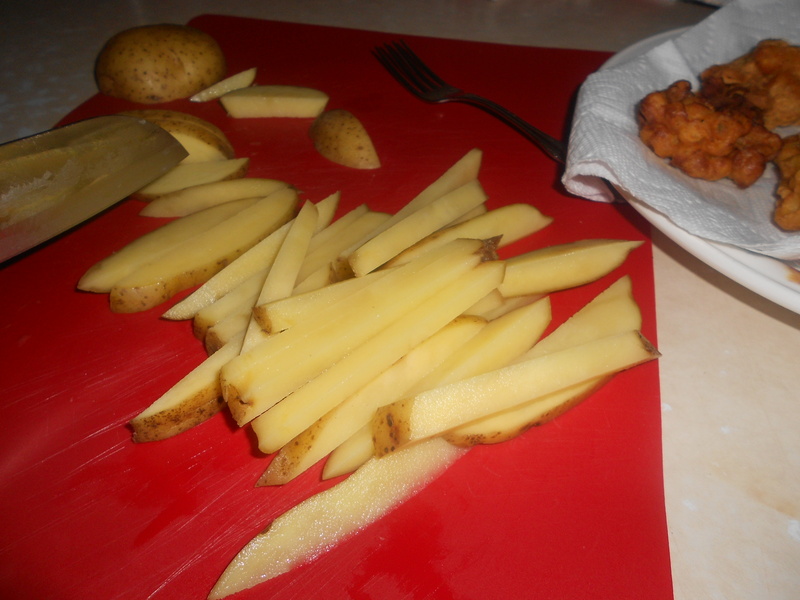 Bear in mind, these fries are for a fluffier batter, as opposed to thinner, more crispy ones. These will resemble onion rings to an extent. Combine everything but potatoes and oil into a mixing bowl and whisk until well-blended. Cut your potatoes up into medium-sized strips, about 1/2″ in thickness, and 5″ in length, but compensate based on the size potatoes you’re using. Add the potato slices into the bowl of batter and stir with a spoon until the potatoes are well-coated. 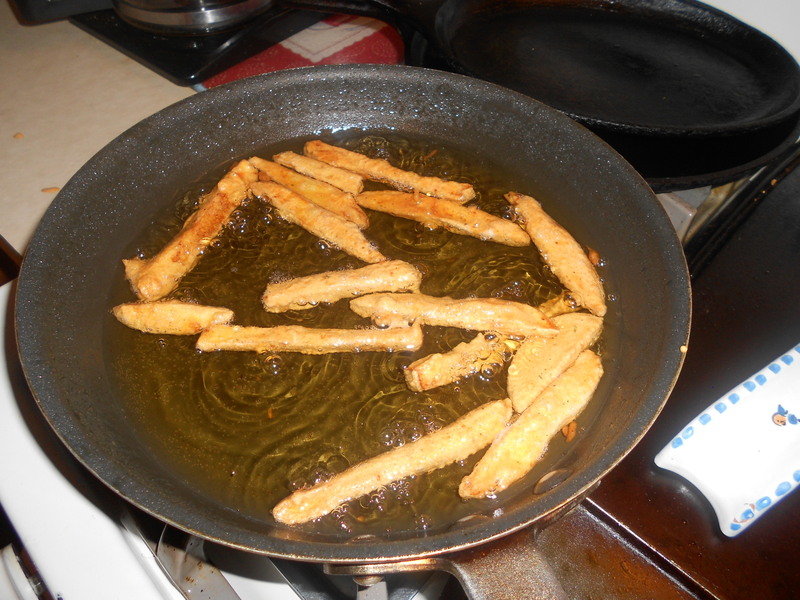 Slowly add the potato strips one by one into the hot oil until the pan is full and begin cooking them. Stir them as you add them in to make sure they don’t stick together. This was our last batch. You can fill the pan way more. 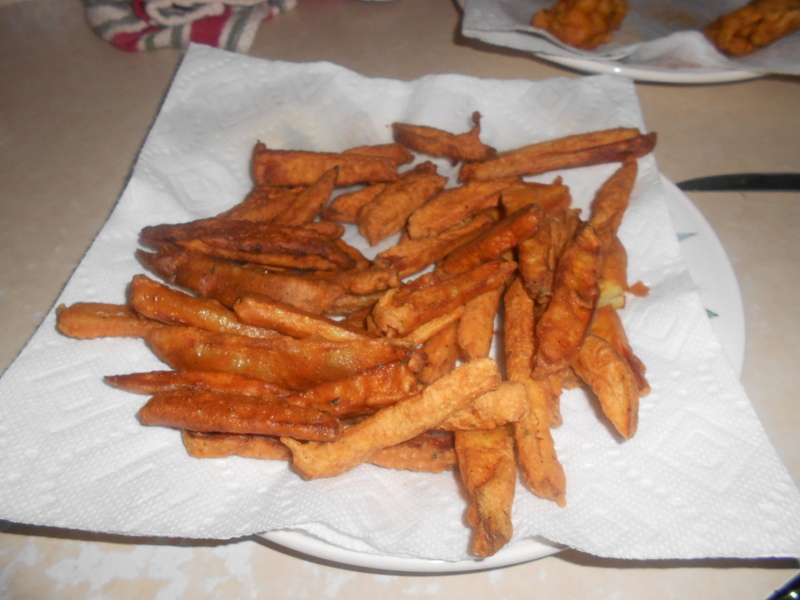 Cook the fries for 5-7 minutes, or until they are light brown and crisp on the outside. Remove them from the oil and place on paper towels to drain. Salt them while still hot, to taste, and serve with or without dipping sauce. This might sound involved to the uninitiated, but honestly the hardest part is physically taking your ingredients out of your cupboards. The rest simply involves picking up or looking at french fries, and realistically will take all of twenty minutes, unless you happen to be cooking for a huge number of people. Otherwise, this recipe is incredibly easy and can be prepared alongside any meal, so long as your consumers are not gluten-free or against the consumption of potatoes. If they’re gluten-free, prepare the unbattered normal french fries. If they’re the latter, then you have some trippy friends and should never cook for them ever again. But no matter, more for you. Posted on January 12, 2014, in We Can Do It Better and tagged awesome, Delicious, french fries, potatoes, recipes, vegetarian. Bookmark the permalink. 5 Comments. I was just wondering, all purpose flour not self rising, right?